St Nicolas Church01323 762247 work ChurchThe modern parish of Pevensey with a population of approximately 4,000 is situated midway between the coastal towns of Eastbourne and Bexhill. It comprises the ancient village of Pevensey, the larger seaside resort of Pevensey Bay and some twelve kilometres of farmland on Pevensey Levels. Named after Saint Nicholas, the patron saint of seafarers, the Church’s origins can be traced to the Roman occupation of Britain and is built on the original site of a Saxon or Priory church dating from the 5th century, which at the time would have overlooked the sea, now some 1/2 mile distant. The Church we see today was built in its present form in the medieval period, between 1205 and 1216. The completed St Nicolas Church remains a splendid example of ‘Early English’, or ‘Early English Gothic’, architecture. England's Gothic architectural tradition originated in France in the mid 12th century and spread rapidly to England. It is the plainest and closest to French building styles of the period. It is typified by the simplicity of its vaults and tracery, the use of lancet windows and smaller amounts of sculptural decoration than either Romanesque or later varieties of Gothic church building. St. Nicolas’ size and relative grandeur reflect the importance of Pevensey as a major seaport at the time of its construction. Evidence suggests that it may have been intended to have been even larger by extending it to the west, but this was never carried out. 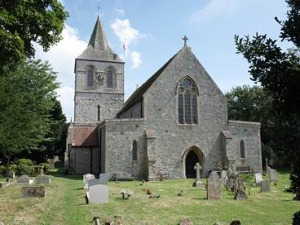 The modern parish of Pevensey with a population of approximately 4,000 is situated midway between the coastal towns of Eastbourne and Bexhill. It comprises the ancient village of Pevensey, the larger seaside resort of Pevensey Bay and some twelve kilometres of farmland on Pevensey Levels. St Nicolas is fortunate to have several notable original architectural features. There are fine examples of medieval windows. The three Lancet window openings above the High Altar are perfect examples of their period c.1200. Also, in the south aisle there are twin windows of Early English style, set in deep mouldings. Both these windows had stained glass installed during the late 19th-century restoration in the reign of Queen Victoria (1819 – 1901).